The entire collection is for sale. As the watches sell, they will be removed from the for sale pages and will be marked as sold. Please contact us for prices. 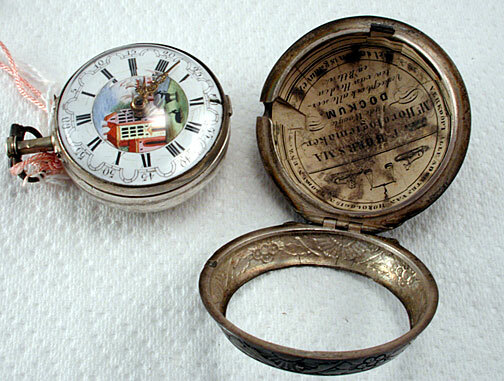 The Pocket Watch Museum is a virtual museum on the Internet. We are an educational site, trying provide information on many mechanical things including pocket watches. We are not a physical museum and the watches are not available for physical viewing. Searching the museum will allow a visitor to view a series of watches. The search is based on various characteristics such as age, maker, type of escapement, or case design. The visitor is presented with watches that match their interests. Then the visitor can select a specific watch and see a description, more technical information about the watch, and additional pictures. The values of many of the watches has been determined, either from appraisal or from a survey by knowledgable people. The collection is now for sale. First, this website will be advertised in the March/April issue of the National Association of Watch and Clock Collectors Mart. Some of the British watches will hopefully be available for display in England. Some of the less expensive watches may make it onto eBay. And finally some of the works will be donated to various horological schools. We are selling the collection. It has been difficult establishing the value of the watches, see my explanation below. We will start by selling the American watches. The pocket watch collection was assembled by my mother, Elizabeth Lord. She was a profession at Washington State University and upon retirement took up pocket watch collecting. We are now actively trying to value the watches in the museum with the expectation of finding a new home for the watches. Should you be willing to help or have any suggestions please contact me using the contact link to the right. I have also been offered assistance in correcting some of the technical descriptions of the various watches. Hopefully those descriptions will improve over time. I want to thank people at the National Association of Watch and Clock Collectors for their assistance in this effort. Should you be interested in a particular watch, please send me a note. I will contact you once we determine a value for the watch. How do you visit the museum? How do you find the watches that interest you? Drop me a note if you have a minute. We do not have any pocket watches to display in the Sands Mechanical Museum. This is a virtual museum, existing only on the Internet. It is not possible to come to a physical building and see watches. There have been several people willing to help establish the value of the watches. They are rare and I thank them. We could just let an auction house sell all the watches. It would certainly establish the value but at great expense to both the collector and to us. There are many collectors who are unwilling to make an offer on a watch. This is understandable because they do not want to have someone else come after and raise the offer. However if the original offer were reasonable, very few if any people would come in and raise it. Other collectors insist that we establish the value first and then they will come in and negotiate. We will avoid these collectors. They want us to establish a value and then lower it? Why do I bother if they will not pay the asking price. Since we do not have any idea as to value, this approach is not possible. In fact, these collectors have been frustrated with our approach and shown a lack of understanding. We will avoid them due to their lack of support. Please visit the forum if you can help or contact us directly at the links provided on the right. The site map is at sitemappocketwatchmuseum.txt. The Google formatted one is in the same place with an .xml extension.